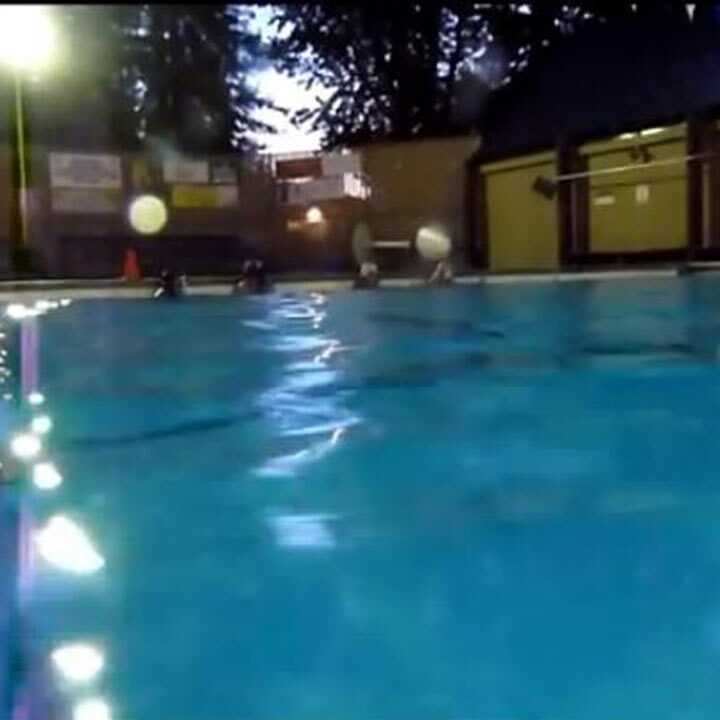 The Sebastopol Sharks play twice weekly Underwater Hockey games at Ives pool in Sebastopol, CA. Any and all are welcome to join our drop in games every Tuesday and Thursday evening. Feel free to stop by for one or more games at any time. If you are new to the sport then contact us first so we can get you set up with equipment to play. If you like swimming, freediving, snorkeling, abalone or scuba diving, this would be a great sport for you! Underwater hockey is a non-contact sport in which two teams compete to manoeuvre a puck across the bottom of a swimming pool into goals. The British Navy invented underwater hockey in the 1950's to keep their divers fit and to improve their ability to move and work efficiently under water. The game came to the US shortly after and has evolved into a fast dynamic sport played in more than 20 countries. Players wear a diving mask, fins and a snorkel for play. Safety gear includes ear protection usually in the form of a water polo cap, a mouthguard, and a glove. The stick coloured white or black to indicate the player's team. In tournament play, the color of the stick and cap are randomly assigned to each team before every game. The puck is made of lead or similar material and weighs about 3 pounds and is surrounded by a plastic covering. The puck's weight brings it to rest on the pool bottom, though can be lifted during passes. The goals are three metres in width and lie at opposite ends of the playing area. Two teams of up to ten players compete, with six players on each team in play at once. The remaining four players are continually substituted into play from a substitution area. Before the start of play the puck is placed in the middle of the pool, and the players wait in the water, touching the wall above the goals they are defending. At the start-of-play signal in-play members of both teams are free to swim anywhere in the play area and try to score by manoeuvring the puck into the opponents' goal. Play continues until either a goal is scored and players return to their wall to start anew, or a break in play is signalled by a referee due to a foul, a time-out, or the end of the period of play. A typical playing formation is the 3-3 (three offensive players or forwards, and three defensive players or backs). There are a number of penalties described in the official underwater hockey rules, ranging from use of the stick against something (or someone) other than the puck, playing or stopping the puck with something other than the stick, and "shepherding" (interposing one's self between a team-mate who possesses the puck and an opponent; one is allowed to play the puck, but not merely block opponents with one's body). If the penalty is minor, referees award an advantage puck - the team that committed the foul is pushed back 3 metres from the puck, while the other team gets free possession. For major penalties, such as a dangerous flick (e.g. at or near an opponent's head) or intentional or repeated fouls, the referees may eject players for a specified period of time or the remainder of the game. A defender committing a serious foul sufficiently close to his own goal may be penalized by the award of a penalty shot or a penalty goal to the fouled player's team. Games consist of two halves, typically ten to fifteen minutes in length and a short half time interval. At half time the two teams switch ends. If you are interested in joining our pick-up games, please get in touch!